Edited by Joe Wright and published by Alex Butziger for the 10th anniversary, “Debacle” is an antidote for the pervasive revisionist history of Ground Zero. Available from Amazon in both print and Kindle versions, its series of essays give a perspective that is conspicuously missing from the “official” post-9/11 narrative. The scoreboard below links to a gallery of Twin Towers logos that are so typical of those to be found all over New Yorkâ€” as if the owners are hoping officials will come to their senses and do the right thing. The Twin Towers are embedded in the culture of New York and the nation. They canâ€™t be airbrushed out of our hearts the way Hollywood ciphers tried to airbrush them out of film archives. 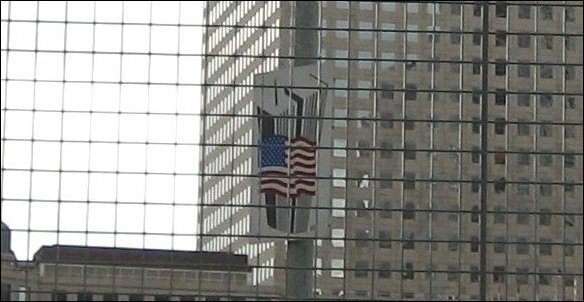 Back in 2007, when the TTA was just a year old, we held a contest and gave away a pair of Yankees-Red Sox tickets to get people engaged in the idea of sending in the Twin Towers reminders they come across on a daily basis. We thought that creative ways of showing how much the Twin Towers still mean to New Yorkers would make an impression on officials. We know better now. But we still encourage New Yorkers and visitors who come across the Towers on a building or vehicle or napkin or on someone’s back to snap a quick photo and then email it to sidewalks@twintowersalliance.com so we can add it to the gallery. The image above is of the famous Shea Stadium scoreboard. It now sits above a concession at the new Citi Field. Shea Stadium, Yankee Stadium, and Giants’ Stadium were all torn down because something more profitable came along to replace them. But just imagine the outcry if the new Yankee Stadium were a totally irrelevant invention, instead of paying such obvious homage to the original? It is a perfect example of how 21st-century Twin Towers could be brand new and exciting and still warm our hearts. If an entire stadium can be demolished for purely mercantile purposes — let alone tearing down three of them — then that surely puts in perspective the ease with which an incredibly depressing, incredibly offensive, incredibly unpopular, and incredibly inappropriate project can be replaced with What the People Want, What New York Needs, What America Deserves! One of these days it’s going to happen. The question is how much more of the public’s time and money do officials intend to waste before they accept the inevitable? The “Restoration Alternative” was the manipulative name officials gave to the option of rebuilding the Twin Towers — no doubt trying to suggest that new Twin Towers would just be retreads of the old Twin Towers — as if anyone would just rebuild the old Yankee Stadium all over again. Of course, the true Restoration Alternative would restore the skyline, not the 40-year-old buildings. The so-called competition that Gov. Pataki staged was actually won by the twin-towered THINK Plan. But as the former Governor who so carelessly trashed the democratic process at a time when we needed to it more than ever explained on national TV in 2009 that he and Mayor Bloomberg thought the THINK Plan was “just terrible.” So the real winner (according to the accepted usage of the word,) which was also the closest any of the “innovative designs” came to twin towers, got bumped and Libeskind it was. Of course, just as the elements of the Libeskind design went through signifiant redeisgns, THINK Plan redesigns might have brought us even closer to what it was we lost. But, so what? Libeskind won and the “democratic process” lost. And the press played along — and is still playing. There is plenty of shame to go around. Guy Tozzoli, the remarkable man who managed the project and made the Towers a stunning reality went on to found and lead the World Trade Centers Association for forty years. The WTCA, which grew to over 300 Trade Centers around the world, with the mission of promoting peace and stability through trade, earned Mr. Tozzoli, numerous nominations for the Nobel Peace Prize. When looking for the name for the restaurant, over two thousand names were considered. But when he heard Caterina Valente sing the the beautiful Burt Bacharach/Hal David song, he knew they had their name. It is incredibly moving in retrospect to realize how perfectly the words captured one of the Towersâ€™ twin muses — because they were soaring shrines to a better world, as surely as they were glorious temples to the worldly can-do spirit. In the long, dark shadow of 9/11, the song is particularly poignant and wistful — especially as sung by Dionne Warwick — or click on the image above to hear Mr. Bacharach perform the song in 2004. 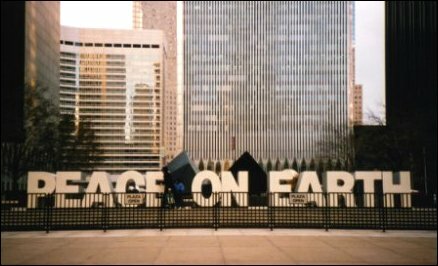 We believe that once the lights of the Towers are shining again, we will be advancing toward a better world of peace on earth. “The city so nice they named it twice” needs its Twin Towers back! The Israelis make a point of quickly rehabilitating terrorist targets back to their pre-target state as the best relief for the victims and the best demoralizer for the victimizers. Why are we doing the opposite — giving our enemies the most gigantic terrorist trophy the world has ever seen by making the evidence of the damage permanent in both the skyline “elements” and the depressing memorial? Instead of making the footprints a trophy, the Twin Towers II memorial, which would incorporate the spectacular carillon of orchestral bells from the “World Memorial” — both designs strongly supported by 9/11 Families — does not build on the footprints, but neither does it glorify them and make them the focus of the remembrance. Preserving and fixating on the footprints is an obscene gesture of recognition of what the attackers did that Israelis would find outrageous and offensive. So why the double standard? Because George Pataki’s ill-advised pledge not to build on the footprints following the attacks perverted the whole memorial. Osama bin Laden and his culture of death are the ultimate in morbid. That is no way to remember the beautiful, sparkling people who loved life and were so loved. These two vintage promos — one from New York City and the other uploaded by a man in Peru! — capture the delight to be found at the Top of the World… Alistair Cooke, the Englishman who hosted the 70â€™s PBS series â€œAmericaâ€ once said: â€œPeople, when they first come to America, whether as travelers or settlers, become aware of a new and agreeable feeling: that the whole country is their oyster.â€ Nowhere was that more true than a quarter of a mile in the sky, with the most fabulous city in the world at one’s feet. 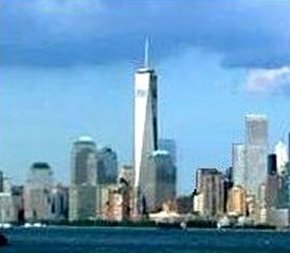 While the situation at the WTC has changed dramatically since this was posted in 2009, there are still ways to win back our skyline. They will be fully discussed in The Swindle At Ground Zero. In the meantime, we are leaving the following evaluation in place. We at The Twin Towers Alliance believe that the only way to displace the current development is with something better, not something theoretical. We can still choose to build a World Trade Center that connects us to the past and improves upon what we lost — instead of the currently planned downgrade. That is why the Twin Towers Alliance is solidly behind the Twin Towers II plan, which has elements of greatness. It clearly is an improvement on what passes for a WTC master site plan today. And the uplifting way it handles the memorial is favored by many of the people who lost loved ones on 9/11 and bitterly object to the current, dispiriting design. Someday we will get to the bottom of what took place. Why has it been up to private citizens to work so hard every step of the way to bring the Twin Towers back to life? It makes no sense. Why did Gov. Pataki and his LMDC relegate â€œThe Restoration Alternativeâ€ to some sort of No Manâ€™s Land? What was behind the arbitrary rules that effectively barred new Twin Towers from their phony competition — in spite of what the majority clearly wanted? Who was pulling George Pataki’s strings? The people are entitled to answers. Beyond the dullness and inertia of the status quo was a deliberate effort to mislead the public about what was happening at Ground Zero. Who was behind that and why? Time will tell, but the pressing need now is to overcome all the machinations and spin by simply showing how much better we still can do, if we summon the will. When people see how poorly the current proposal compares to the Twin Towers II plan in every way, it will be impossible to sustain. Much of the groundwork that has been done at the site had to be done anyway so it would be misleading to suggest that it would be wasted under the Twin Towers II plan. When the Towers went down steelworkers offered to work for free to put them back up, entrepreneurs wanted to invest in the project, and visionaries offered to rent the top floors of new towers. And support will quickly reappear if we can get the media to ask the real questions. We can still transition to a twin-towered WTC and arrive at our destination much more quickly than is now planned because the project will take on a life of its own. 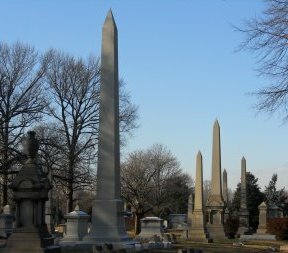 If officials had only had some respect for the people’s common sense, we wouldnâ€™t have wasted all these years â€” only to find ourselves forced to pour more time and taxpayer money into shuffling state and federal workers around to make up for the private sectorâ€™s lack of interest in the ironically-named â€œFreedom Towerâ€. But, so far the General Services Administration has gone no further in converting its non-binding contract into a secured commitment. No doubt the imprudence of promising to lease AAA space with taxpayer funds in a building that is not popular with the people is being resisted behind the scenes. There have been a number of very creative efforts made over the years to imagine new Twin Towers. What sets Twin Towers II apart is Kenneth Gardner’s dedication, which resulted in a fully designed plan that could actually be in construction in a matter of months. He deserves great credit for his faith and the years of sacrifice. involving thousands of hours, required to develop and refine the plan, against the prevailing “wisdom.” Because it means that there is a viable alternative to the current disgrace.